This summer, the government held a consultation about how new oil and gas licences may affect the UK’s most important wildlife sites. The new licence blocks were announced under the 14th round in August. The government was required to assess what impact oil or gas operations would have on wildlife sites protected under European law. 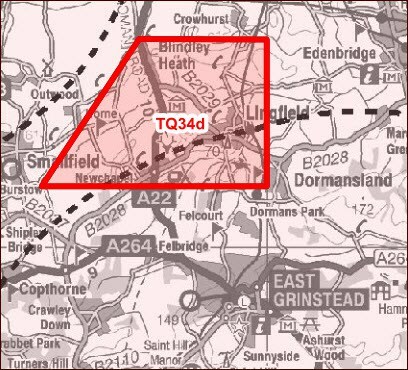 Block TQ34d is close to the Ashdown Forest Special Protection Area. EU member states have a duty to protect the habitats of migratory birds and certain particularly threatened birds in SPAs. It also overlaps with a wildlife site managed by Surrey Wildlife Trust at Blindley Heath. A leading conservation charity, The Wildfowl and Wetlands Trust, said the consultation breached good practice guidelines as it only lasted six weeks (including half of August and a bank holiday). Yet it covered 159 individual licence blocks and the background papers ran to hundreds of pages. Good practice recommends that consultations on new, complex or controversial issues should allow 12 weeks for comments. Surrey Against Fracking is holding a public meeting with short film clips and speakers from Balcombe. All are welcome. « Horse Hill: What’s happening?